United Airlines would be within its rights to terminate its employee pension plans but hasn't yet decided to do so, an attorney for the carrier said Friday, as two unions urged a judge to block a financing plan they say is predicated on the airline halting fund contributions. The hearing came a day after the release of court papers in which United warned it "likely" will have to end those pension funds in order to secure the loans it needs to get out of bankruptcy. Such a default by the nation's second-largest airline would affect about 119,000 employees and retirees and be the largest ever by a U.S. company. The International Association of Machinists and Aerospace Workers, representing more than 20,000 ramp workers and customer-service agents at United, and the Association of Flight Attendants had already filed court objections to the company's interim financing plan and its decision to stop payments to the pension funds. In July, United deferred a required quarterly pension fund payment of $72 million, characterizing it as a "huge financial burden" and saying it planned no further payments while in bankruptcy. United Airlines attorney James Sprayregen told the court Friday that federal bankruptcy laws trump employee-benefit rules that require companies to make regular contributions to their pension plans. "We understand the stress and concern this has imposed on our employees and retirees," Sprayregen told U.S. Bankruptcy Judge Eugene Wedoff. "However, we believe we would be doing the court and our constituents a disservice if we didn't communicate where we are in our thinking." Sprayregen said the company's amended financing plan does not preclude it from contributing to the pensions if the money is available. Attorneys for the unions, which say the company's plan to borrow an additional $500 million in interim financing effectively requires it to stop pension payments while in bankruptcy, disagreed with that argument — as did dozens of United retirees in the courtroom, many wearing T-shirts reading: "Pensions are promises that cannot be broken." The union attorneys were to present their arguments Friday afternoon. Shirley Telegdy, who retired three years ago after 37 years as a United customer service representative, said before the hearing that she relies on her pension payment for virtually all her income. "I thought I could enjoy retirement at 62," she said. "Now I have to give up everything." In its 26-page bankruptcy court filing released Thursday, Elk Grove Village-based United cited "stark" financial conditions and the need to maintain liquidity and cash flow to get the financing to emerge from Chapter 11 in saying it "likely" would have to terminate the pension funds. United faces half a billion dollars in pension contributions in the next two months and $4.1 billion by the end of 2008. The government recently rejected its bid for a $1.6 billion loan guarantee, and rising jet fuel prices are expected to cost the airline $1 billion more this year than expected. "Given the magnitude of further cost reductions needed to create a viable business plan and attract exit financing, termination and replacement of all our defined benefit pension plans likely will be required," the airline said in the filing. 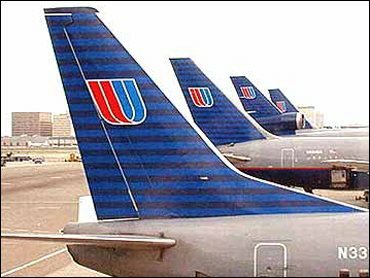 Since United entered bankruptcy in December 2002, employees have been dealt steep wage and benefit cuts as the airline has restructured. The machinists union has also sued the airline's top three executives in federal court, accusing them of a breach of fiduciary duty. And the government-financed Pension Benefit Guaranty Corp. has accused United of violating federal law by cutting off pension contributions. United's pension plans currently are underfunded by about $8.3 billion. If the company scraps the funds, the PBGC would be expected to take responsibility for up to $6.4 billion.